NIGERIA has welcomed a US decision to send up to 300 military personnel to Cameroon to help the regional fight against Boko Haram, despite having itself requested more direct help from Washington. President Muhammadu Buhari’s spokesman Garba Shehu on Thursday said the deployment was a “welcome development” while the military said it demonstrated cooperation was needed against the Islamists. Washington last year provided intelligence, surveillance and reconnaissance expertise to Nigeria in the hunt for more than 200 schoolgirls abducted from their school. The assistance included drones and spy planes as well as up to 80 military personnel sent to Chad’s capital, N’Djamena. In 2013, the US set up a drone base in neighboring Niger. But the US is not only involved in fighting back Boko Haram on the continent. 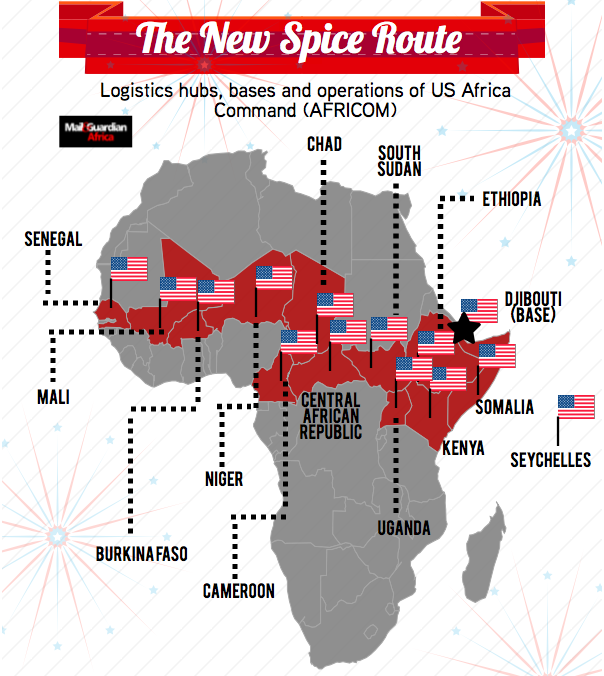 In recent years, the US has quietly ramped up its military presence across Africa, even if it officially insists its footprint on the continent is light. The decisive point seems to have been the election of President Barack Obama in 2008. For years, the United States Africa Command (known by the acronym AFRICOM) has downplayed the size and scope of its missions on the continent, and without large battalions of actual boots on the ground, as was the case in Afghanistan and Iraq, you’d be forgiven for missing its unfolding. But behind closed doors, US military officials are already starting to see Africa as the new battleground for fighting extremism, and have begun to roll out a flurry of logistical infrastructure and personnel from West to East – colloquially called the “new spice route” – and roughly tracing the belt of volatility on the southern fringes of the Sahara Desert; the deployment to Cameroon is just the latest of many. These support all the activities that American troops are currently involved in Africa: airstrikes targeting suspected militants, night raids aimed at seizing terror suspects, airlifts of French and African troops onto the battlefields, and evacuation operations in conflict zones. Officially, the US has only one permanent base in Africa, Camp Lemonnier in Djibouti, headquarters of the Combined Joint Task Force – Horn of Africa (CJTF-HOA). Concrete figures on the number of troops stationed there are sketchy, but various reports put it anything between 3,500 and 4,500 soldiers. It provides a vital base for US Special Forces, fighter planes and helicopters, as well as serving as a base for drone operations into Somalia and Yemen, and maritime surveillance in the Indian Ocean. There are drone ports in the Indian Ocean island of Seychelles, off the eastern coast of Africa, as well as in Ethiopia, in the southern region of Arba Minch, that provide support for flying intelligence, surveillance, and reconnaissance missions. Nzara in South Sudan is another shadowy operating post on the continent where U.S. Special Operations Forces have been stationed in recent years, according to reports by investigative journalist Nick Turse, who has written extensively on AFRICOM’s growing presence on the continent. Turse, author of the book Tomorrow’s Battlefield, US Proxy Wars and Secret Ops in Africa, lists other “temporary sites” sites including Obo and Djema in the Central Africa Republic and Dungu in the Democratic Republic of Congo (DRC). In terms of operations, the US has deployed missions code named Juniper Micron, that aided French troops in Mali; Echo Casemate, that airlifted Burundian troops to the Central African Republic, as well as Observant Compass, that deployed US soldiers to destroy what’s left of Ugandan rebel leader Joseph Kony’s murderous group Lord’s Resistance Army in central Africa and eastern DR Congo. More than anything, however, the US conducts military exercises, training missions and advisory assignments with local African armies, to do battle against militant groups like Boko Haram as well as Somalia’s al-Shabaab and Mali’s Ansar al-Dine. AFRICOM conducts some type of military training or military-to-military activity with nearly every country on the African continent. In 2014, there were 11 large joint military exercises, including African Lion in Morocco, Western Accord in Senegal, Central Accord in Cameroon, and Southern Accord in Malawi, all of which had a field training component. AFRICOM also conducted maritime security exercises, including Obangame Express in the Gulf of Guinea and Saharan Express in the waters off Senegal. According to one count, in 2014, the combined total of all US Africa Command activities on the continent reached 674. In other words, US troops were carrying out almost two operations, exercises, or activities—from drone strikes to counterinsurgency instruction, intelligence gathering to marksmanship training—somewhere in Africa every day. This represents nearly a four-fold increase from the 172 “missions, activities, programs, and exercises” that AFRICOM inherited from other commands when it began operations in 2008. And it looks like the US is going to be in it for the long haul. Camp Lemonnier in Djibouti is currently undergoing a $1.4billion upgrade, expanding everything from aircraft maintenance hangars, ammunition shelters, runway and taxiway extensions and accommodation facilities. Since 2002, the camp has grown from 88 acres to nearly 500 acres, and in 2013, 22 projects were underway there, more than at any other US Navy base anywhere in the world. In May 2014, the US reached an agreement— called an “implementing arrangement”—with the government of Djibouti “that secures [its] presence” in that country “through 2044,” meaning the US plans to be there for at least 30 more years. Apart from Djibouti, the staging areas, mini-bases, and airfields that have popped up across the continent now mean there’s a contiguous US presence in the nations of Senegal, Mali, Burkina Faso, Niger, Chad, the Central African Republic, South Sudan, Uganda, Kenya, Ethiopia, Somalia, and the Seychelles. Meanwhile, in June, Ethiopia and Djibouti oversaw the completion of a railway linking their two capitals Addis Ababa and Djibouti. The thinking is that the railway could eventually extend west, reaching all the way to Cameroon, connecting the Red Sea to the Gulf of Guinea. A trans-Africa railway is feasible “in seven or eight years,” said Abubaker Hadi, chairman of Djibouti Port Authority, as long as conflicts in South Sudan and the Central African Republic Republic (CAR) come to an end. If AFRICOM succeeds in clearing the brush, Djibouti and Ethiopia just might become the regional hegemony they dream of; all they may have to do is follow the “hippo trench” all the way to the Atlantic Ocean. And the “belt” the US military is building, would not only be the trench against the advance of extremist violent organisations southward, but also the guard line for what could be Africa’s longest-running pan-African transport corridor.